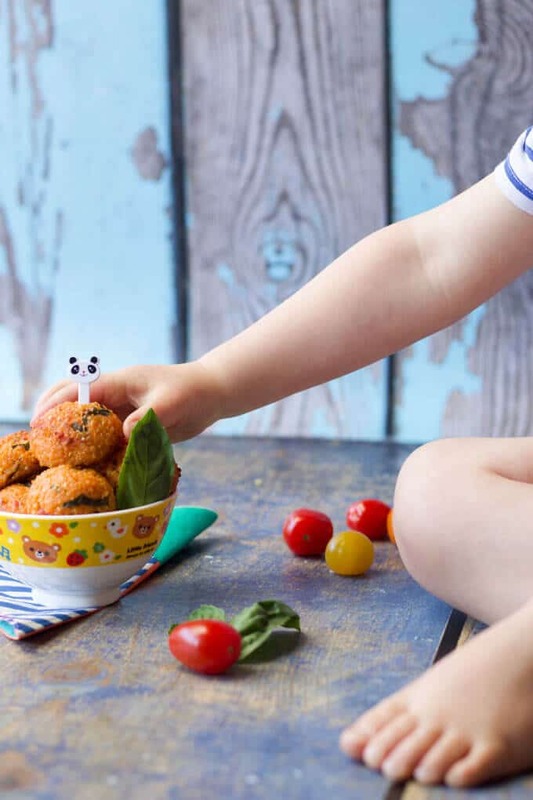 These Cheese and Tomato Quinoa Balls are perfect for little hands and something the whole family can enjoy. I started by sautéing an onion with some garlic and then added chopped tomatoes and water. To this, I added the quinoa and brought it to a boil. I then popped a lid on, lowered the heat and allowed it simmer until the liquid was absorbed (around 15 mins). After leaving it for 5 minutes, with the pan lid still on, I added grated cheese and chopped basil. Once cooled I stirred in the beaten egg and formed the mixture into 13 heaped tablespoon sized balls. Before putting the quinoa balls in the oven I broke them in half, added a small pinch of mozzarella and closed them back up ensuring the mozzarella was fully encapsulated. These quinoa balls taste great hot or cold. If you eat them cold you won’t enjoy the gooey mozzarella centre the same but they still taste great. They would be perfect for a packed lunch or to have in the fridge ready for a quick meal. 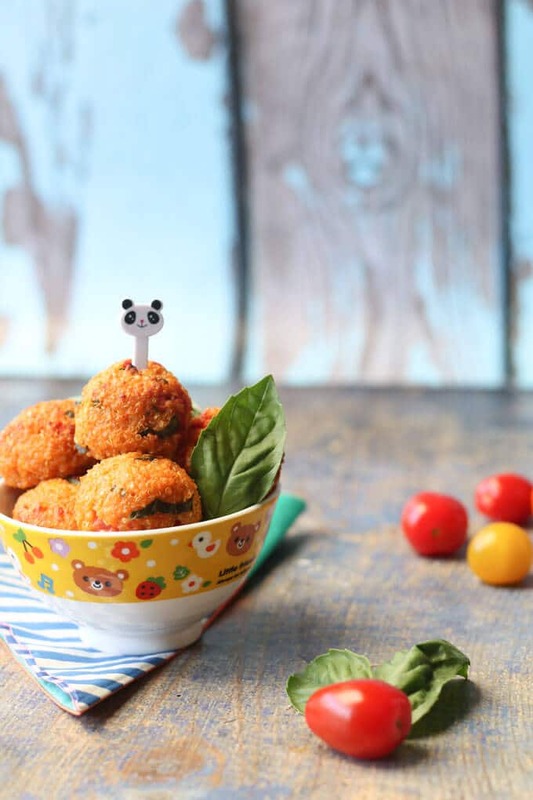 As these were a big hit with both Rory and Finn I’m definitely going to try out a few other variations of quinoa balls. The combinations are endless but off the top of my head I’m thinking Spinach & Cream Cheese, Sweet and Sour, Mexican and Curried Chicken would all work well. 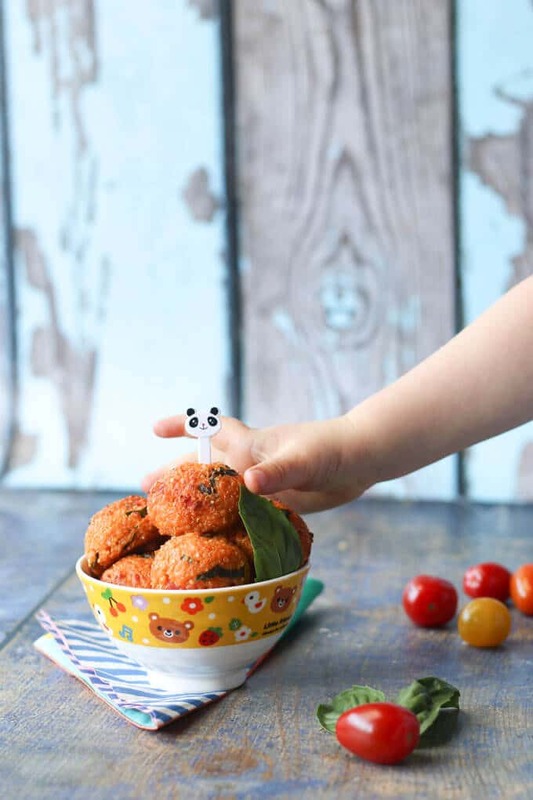 Delicious tomato, cheese and basil quinoa formed into balls to make it perfect for little hands. In a bowl soak the quinoa in water. Heat oil (or butter) in a pan and gently sauté the onions and garlic until the onions become translucent. As the onions are cooking, thoroughly rise the quinoa. To the onions and garlic, add the tomatoes, stock, quinoa and stir. Bring to the boil then reduce the heat to low, cover and allow to simmer for 15 mins. Stir in the cheddar cheese & basil. Allow to cool and then stir in the beaten egg. Form heaped tablespoon sized balls. (Optional) break each ball in half, add a small ball of mozzarella and re form the balls making sure the mozzarella is fully covered. Cook in the oven for 25 mins or until golden. Also great for big kids like me!! So quick and easy, and a great alternative to falafel for my work lunches! Thanks Feeding Finn! Thanks for your comment, I’m glad you liked them. I plan to try a few other varieties soon and will post the best ones. Stay tuned! I absolutely love your site, great recipe ideas. I wondered if these Quinoa balls could be frozen? Hi Ana, thanks for your kind comment. I haven’t frozen these before but I have frozen a similar recipe and it worked well. Hi Toni, thanks for your comment. I’ve frozen these before and they froze well. Most of the recipes are ok for freezing. Thanks for so much great recipe inspiration! LJ directed me to your site and I’ve been a frequent visitor ever since. I have just made these with some bits of vegetables I had in the fridge as I didn’t have tomatoes or basil, so put pumpkin, brocolli, carrots and seasoned with oregano. Still so yum! I have some cream cheese and spinach needing to be used up so will be giving that a go as well. Good served as just a risotto type dish as well! Hi Deb, sorry you are having trouble with the recipe. Was all the liquid absorbed after you cooked the quinoa? It should all be absorbed and then your stir through the cheese. I chill this mixture and then add the egg and have had no issues with forming into balls. I’m wondering if you could grease a baking tray and turn it into a quinoa bake instead. Alternatively you could try adding some breadcrumbs to soak up some of the moisture. I’ve never made quinoa before – what do you mean when you say ‘rise the quinoa?’ Is it supposed to say rinse? Yes, sorry, it should say rinse! I saved time by putting these in a mini muffin tray. I love anything in mini muffin form. Looks so neat! Plus it’s easy for those little fingers to grasp!